Sixteen Candles meets Sliding Doors in this hilariously charming and irreverent YA debut. 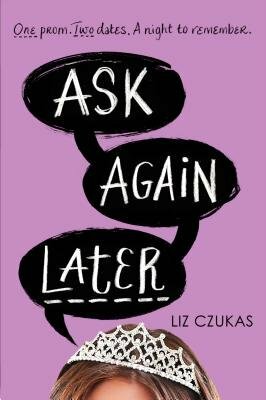 Fans of realistic teen fiction like Lauren Barnholdt's Two-Way Street and Sarah Mlynowski's Ten Things We Did (And Probably Shouldn't Have) will love Ask Again Later's pitch-perfect tale of prom night drama--with a twist. Heart LaCoeur has zero interest in a messy high-school romance, no matter what her name suggests. That's why she's decided to avoid prom angst by going with a group of single friends. And that's why, when two surprise prom invites derail her brilliant plan, Heart takes the only foolproof, drama-free solution: a coin flip--that somehow gives her the chance to live out both prom nights. Heads or tails, where they both end up might be the most surprising thing of all. . . .